In 2015, Kenya Power announced it was considering venturing into the home internet business. The company was to rely on its extensive distribution footprint to actualize the plan and with an already established customer base, payment infrastructure, the plan seemed plausible. Early this year, the company announced its subsidiary Kenya Power International was going to partner with telco Safaricom to actualize the plan. As per the partnership, Safaricom and Kenya Power International were to conduct a pilot for fiber to the home in 12,000 homes for a period of 12 months. Not much has been sad about the project in the press but the two have been working at executing the pilot. Safaricom, which has to date rolled out 3200 km of fiber reaching 7,000 homes has been conducting a pilot in Langata and is about to go live with the project. If the project, which has been using Kenya Power Cables proves successful, then the telco will go on a full scale roll-out of the solution in different residential areas in Nairobi. Kenya Power cables have proved particularly useful for Safaricom, which previously relied on underground cable to connect new clients. This not only proved expensive with the whole opening up of trenches, but also proved a challenge with accessibility to buildings. If successful, the next area of action will be in content provision, where Safaricom is seeking partnerships with content providers such as Showmax, thereby allowing users to access a wide variety of content. Word on the street is that there are plans for Safaricom big box version 2, which will have better support for streaming services. If successful, Safaricom will effectively disrupt Wananchi’s Zuku which has held pole position in the home market segment. Zuku has delivered its product under a triple-play model that bundles television, data and telephony services. If Safaricom guarantees better quality services at a cheaper price point, then the company will effectively succeed in this quest. Kenya Power on the other hand already owns and operates more than 4,000km in length of fibre optic cable network in Kenya, which it leases to the major telecom players in the country. Its wide coverage of buildings through power connections will also make it easier for Safaricom to gain entry into most households. 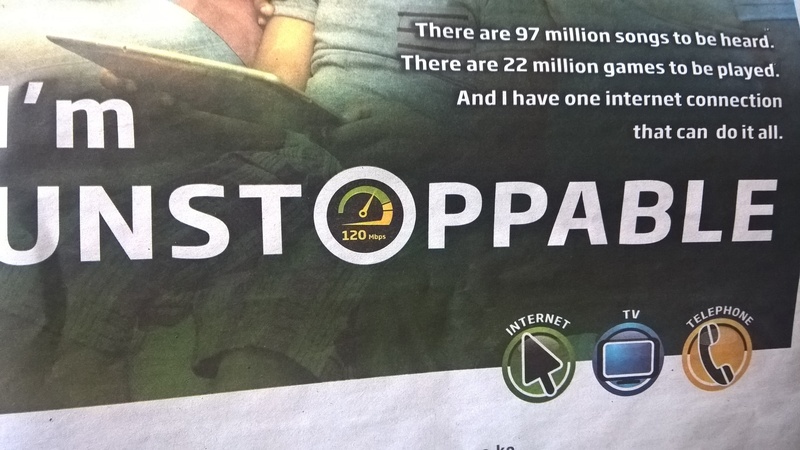 This is an advert, doesn’t confirm what’s on the ground. Maybe they will have a product marketed as 120Mbps on the high. We all know that this is where the fight has been, what’s promised versus what consumers actually get. Zuku are cunning and very funny you pay for 20mpbs and get 3mpbs. This company is a sham and they need stiff competition to make sure they honor their pledge to customers. I wouldn’t hold my breath on this one. Safaricom’s big box has been a complete flop despite the company’s best attempts at getting Kenyan’s to sign up. Their business fibre offerings are less than competitive, with incredibly high setup costs (30k for initial setup is a bit ridiculous) followed by monthly payments that are matched by JTL and ZUKU for less overall speeds. This company stagnated (in terms of innovation at least) after Mr.Joseph left, and will probably be there for a while. Well, about innovation, Safaricom CEO Bob Collymore is quoted to saying they are stagnant on that front, at least where Mpesa is concerned. I don’t know what this means for other products, but Safaricom Big Box was not well thought out when going to market. You should check their fiber to the home packages they are on par with Zuku and trust Safaricom to deliver to deliver on speeds.